Peanut! Looka, looka! Your jungle gym! Brought to you by your friendly neighbourhood Papa-man! NO! I WANT THE WARNING LABEL...WHY DOESN'T IT COME OFF?...WAAAAHHHH! Haha LOL.. Has she not yet started asking for spoons and steel cups? WHAT is it with babies and tags! I bookmarked this link ages ago and am seriously thinking of getting one of these. Timepass: Nooo...but I already feel a major headache coming on. Thanks. Mala: Don't bother. My cousin got her a 'Taggies' dog - very sweet, with tags all over its ears and tail, etc - but Peanut just kept playing with the wrapping paper it came in. I think spoons and steel cups will do just fine. PR: Yeah, exactly. It's always the wrapping. Isn't that typical of babies to zero in on the most mundane of things missing all the bells and whistles attached to the said thing! Cute, cute, cute!!! Awww... that picture is so very cute! Well, yeah! Didn't you know we actually buy these things for their tags? Everything else is just thrown in like dhaniya mirchi :D Start saving the cardboard boxes that stuff comes in and you might never need to buy Peanut a toy! S still begs us to save cardboard boxes for a few days so she can play with them. A friend gifted M a book of tags and I can't find it anywhere. AAAAAAARGHHHHHHHHHH!! Mala - if you live in the US, try TJ MAXX stores - you will find these toys for less than half price there. We checked the price of the taggie blanket at Babies R US the last time we went there and it was priced at friggin' 20 bucks!! At TJ MAXX I might find it for 9.99 or even 7.99 if lady luck smiles upon me. Y, sorry to hog your comment space. N: I don't KNOW what's typical of babies. I'm learning as I go along. No one tells me anything. Okay, no one tells me everything. Suki: Missed calls from admirers. Ah, to be young again. Cee Kay: Not at all, go right ahead. For you - anything. T J Maxx, huh? With my kids (they're 7 and 5 now) it wasn't even the boxes the toys came in - it was random boxes like biscuit boxes and milk cans that fascinated them! I guess we start early in life being dissatisfied with what we have and wanting what we can't! lol! Tags, spoons, cups, these are my favourite things! And why do parents parents spend money on the toys, the teddy bears! Hi Delurking the first time though have been a fan of your blog since a long time. See the thing is I can read blogs from work;) but when I click on the comments that section is blocked:((( Anyways got some time at home today. I really enjoy your posts because my daughter is 11 months old and oh what a joy they are arent they...I see my daughter in everything you write about peanut and the things she is doing...it is really amazing what interests babies...honestly we have stopped investing on toys...as everybody says small kitchen utensils..remotes tearing books tags on the toys these are the things which interest her..
Aww.. That is soo cute!! You must really mark this post on your blog and show it to your kid once grown up! me likey jungle gym!! that counts..? Still searching: You said it. Sigh. K3: That's it, no more toys being purchased. Keerthi's Mom: Thank you for delurking. and reminding me about missing her when I get back to work. Gah! Candid confessions: You kidding me? 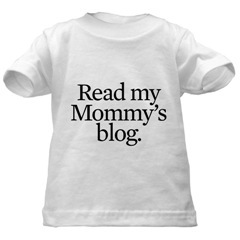 This blog will be gone way before she learns to read. Can't embarass her like this! well, atleast she stays in there. hana didn't last even one minute. she hates those playmat things.